This is .357 Mag. Hornady 158gr. XTP Jacketed Hollow Point Ammo. XTP bullets are famous for their ability to expand reliably across a wide range of velocities. The XTP bullet was specially built to withstand incredible velocities, and still deliver controlled expansion and weight retention. Special features in the nose facilitate and control expansion on impact. XTP bullets consistently deliver the deep, terminal penetration needed for one-shot kills. This ammo is brass cased, boxer primed, non-magnetic, and non-corrosive. It comes packed in 25rd. boxes. Muzzle Velocity: 1250 fps. In hopes of giving ourselves and our customers a better idea how this 357 Magnum self-defense ammo would perform if called upon in a self-defense scenario, we tested dozens of the best selling hollow points on the market. 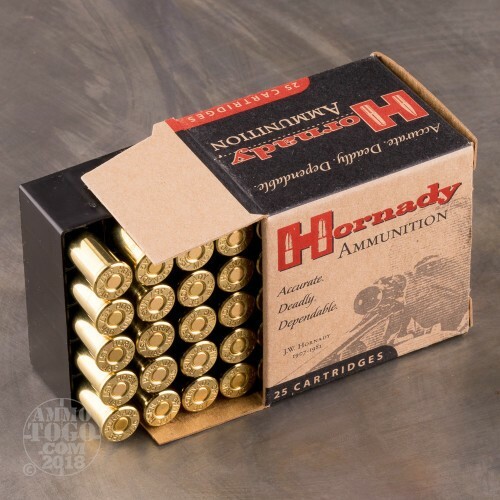 We fired five rounds of this Hornady Ammunition 357 Magnum ammo through a cloth barrier into Clear Ballistics calibrated synthetic gelatin and recorded the results. For these tests, we used a S&W 640 with a 2.125-inch barrel. In the photos, graphics and video on this page, you can see specifically how the Hornady Ammunition ammo performed and how it sticks up with the rest of the 357 Magnum ammo we have tested so far. 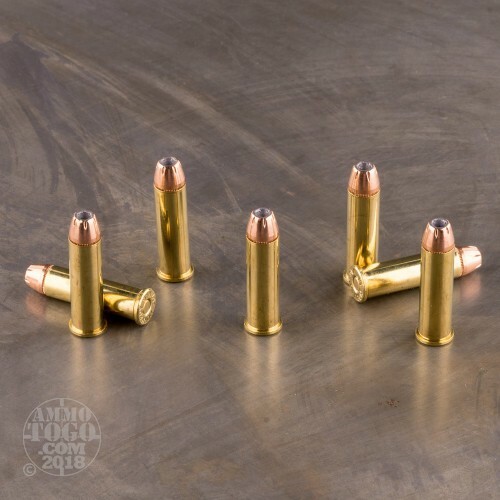 To read more about our testing procedures and discover what round makes the best self-defense ammo for you head to this page. 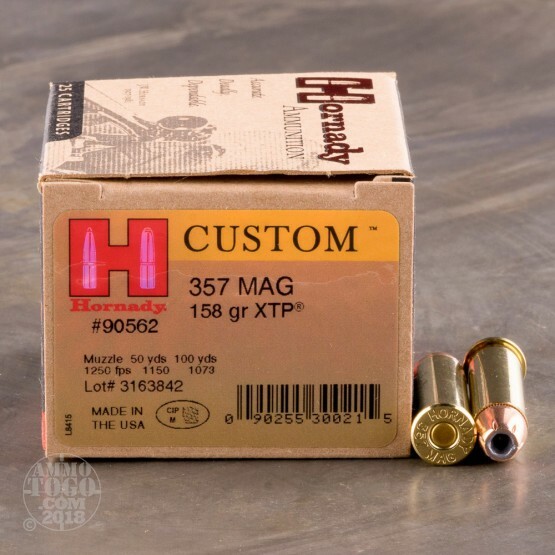 How do the results for this Hornady Ammunition 357 Magnum compare to other 357 MAGNUM? Expansion Diameter Compared to All 357 Magnum Ammo Tested MIN 0.35" MEDIAN 0.55" THIS AMMO 0.49" U.S. dime MAX 0.75"
Penetration Depth Compared to 357 Magnum Tested 0" 10" 20" 30" MIN 9.2" MEDIAN 17.3" THIS AMMO 22.2" MAX 41.7"
I have been shooting this ammo out of my 6 1/2" Taurus 608 revolver with no misfires at all. Only snafu is periodically a round will not eject when rod is pushed,but will eject on next push. 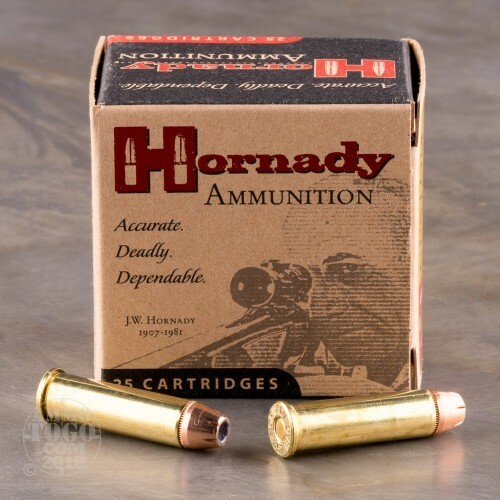 I plan on using and buying this ammo as long as I can and would recommend as such to others. Put a carton of 25 thru my 6" Python with flawless results. Will purchase again. Had a terrible experience with this ammo. Was thinking about using this as my carry round. bought a box of 25 to try. shot 10 rounds and only 7 went off. for those keeping score at home that's 30 percent that didn't work. i was extremely disappointed with this round.